The potassium-rich bananas make it a suitable choice for hair care. It helps maintain and restoring the natural elasticity of your hair. It also helps soothe dry hair and keep your hair moisturized. Bananas also contain vitamin B6, A, C, and E, and are packed with beneficial iron and zinc as well. It is due to these ingredients that a banana hair mask can work wonders for your hair. It is actually an effective deep hair conditioner and works great to soothe itchy scalp and smooth frizz. It is true that using banana for hair is a simple and natural way to improve its texture and overall health, but you can try certain recipes to make an even effective banana mask for hair. The simplest thing is to get a banana, mash it, and massage it gently into your scalp and hair. Just be sure to mash it well to make a smooth paste and it will be a piece of cake. Cover your head with a shower cap. You can even use a hairdryer to dry your hair faster. Your scalp will absorb nutrients from this banana mask for hair and give you long, healthy hair. Here are some other banana hair mask recipes that will help you extract all benefits from this amazing fruit. All of the ingredients of this recipe are good for your hair. Coconut milk contains fats and antioxidants, which help boost your hair volume and protect your hair with oils and proteins. Coconut oil contains healthy fatty acids and vitamin E that promote hair growth and reduce keratin loss – it also has lauric acid that has antifungal and antibacterial properties, so it is quite beneficial if you have dandruff. Finally, this recipe uses honey that is a humectants and locks moisture in your hair – it also contains iron, zinc, B vitamins, and sulfur that promote hair growth. First cut a banana into smaller pieces and put them all in a small bowl. Add a couple of tablespoons of coconut milk with a tablespoon of coconut oil. Also, add a couple of tablespoons of honey and put these ingredients in your blender. Blend for about a minute or so, or until you get a smooth paste with no banana chunks. Apply this paste to your dampen hair and massage for a few minutes and cover with a shower cap. Wash your hair after half an hour. Do this at least once a week for good results. If you are concerned about your brittle hair, you need something that contains vitamin E. This banana hair mask will provide all the right nutrients to your hair to repair damage. It enables growth of your capillaries and gets you fine hair in no time. 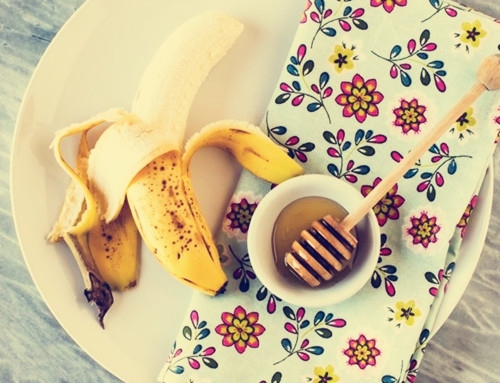 All you need for this hair mask is a couple of bananas, a vitamin E capsule, and honey. Start by mashing bananas in a small bowl. Add a couple of tablespoons of honey to the bowl and add a vitamin E capsule as well. Mix it well and apply this paste into your damp hair. Start at the roots and move towards the ends, and never brush your hair when you're applying this mask. Wear a shower cap and use your blow dryer on your hair to ensure all the nutrients penetrate into your hair cuticle. Wrap your hair in a towel and leave for half an hour. Remove the towel and use a shampoo to rinse your hair. Finish by rinsing with very cold water. Banana for hair is quite beneficial, but honey and yogurt will work even better to get you healthy, shiny hair in a short time. The presence of lactic acid makes yogurt a wonderful remedy for your dry, damaged hair – it is equally effective for your skin. To make this mask, you need 3 ripe bananas, 2 tablespoons of yogurt, 3 tablespoons of honey, and a tablespoon of milk. Add these ingredients to your blender and blend for a few seconds. You can add some milk to it and turn it into a liquid form. Use this mixture on your freshly washed hair and massage gently with your fingertips for a few minutes. Wear a plastic cap and leave for an hour or so. Use a shampoo to wash your hair and condition as well to have smooth, shiny hair. You don't have to waste those brown and squishy bananas because overripe bananas will work just fine to make a hair mask. You should ensure that your hair mask is in the form of a smooth paste with no visible chunks of bananas or it may stick to your hair. You may consider adding some warm water to your hair mask if you're using solid coconut oil. You can make use of peppermint oil, lavender oil, or rosemary oil to make your hair conditioner smell good.